I’ve already expressed a love for chinese hot and sour soup. In my pre-veggie days, my second favourite chinese soup was chicken and sweetcorn. It’s one of the great comfort soups of the world I think. The problem was, I could never recreate it properly. I tried different combinations of garlic and ginger, different levels of smoothness from blending the sweetcorn – none of it worked. None of it tasted right. Then I stumbled on a magazine recipe that gave away the secret. I’ve lost the magazine cutting now, but I’ve retained the secret ingredient. Let me whisper it to you. That’s it. Forget complicated spicing or other combinations. The flavour and texture is based on creamed sweetcorn. 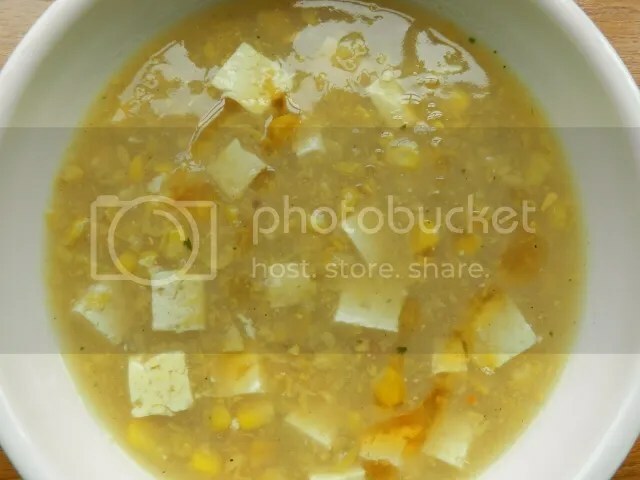 I don’t know how ‘authentic’ take-away sweetcorn soup is, but now you can make the authentic inauthentic version for yourself anytime you please. 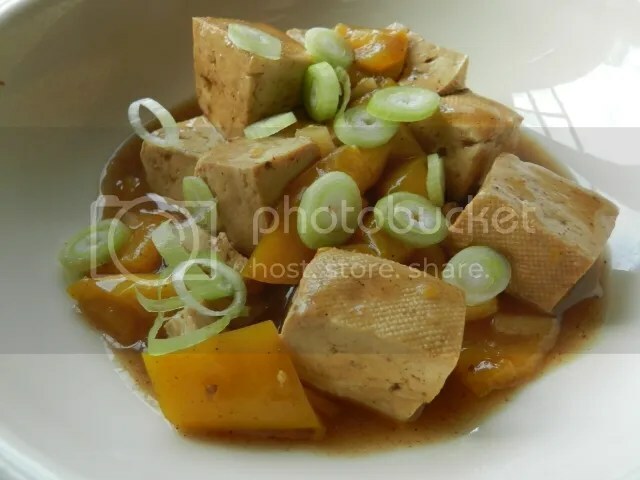 Put the tofu in a bowl and mix with the soy sauce. Leave to marinade for at least half an hour. Heat the creamed sweetcorn, vegetable stock, ginger and frozen sweetcorn in a pan and simmer for 5 minutes. Add the tofu and its marinade and simmer for another 10 minutes. Serve with some sesame oil drizzled over. I came across chinese hot and sour soup when I first developed my chinese restaurant habit in the late 80’s when I lived in London. I don’t know where I first had it, but the moment that combination of heat and sourness hit my tastebuds I was hooked. It’s a great soup to do at home because you can replicate a restaurant taste without a huge number of specialist ingredients. 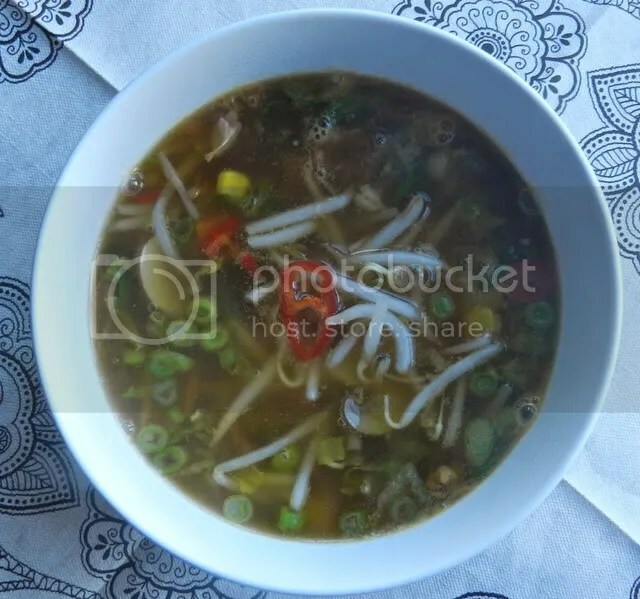 If you have bamboo shoots and shiitake mushrooms around then by all means use them, but if not it’s a great ‘what have I got in the fridge’ soup. I vary the ingredients practically every time I make it, so please just take this ingredients list as a suggestion not definitive list. There are three things I always include – mushrooms, carrots and peas. It has to have peas. This is in honour of the time I was eating it in Poons off Leicester Square (my favourite restaurant at the time, now sadly gone), thinking that my mouth was on fire and realising that what I had taken for peas in the soup were actually rings of green birdseye chilli. It’s low fat (or no fat if you leave the sesame oil off), packed with veggies, quick to make and the taste will knock your socks off. What’s not to like? Add the stock, garlic, ginger, chilli, soy sauce and vinegar to a saucepan and bring to a gentle simmer. Add the carrot, mushrooms, peas, sweetcorn and simmer for 5-10 minutes until the vegetables are cooked. Keeping the soup at a simmer, add the lettuce and spring onion. Add the cornflour and stir until the soup thickens a little. Turn off the heat and mix in the beansprouts. Serve, drizzled with a little sesame oil. The last time I went to a Chinese restaurant, I was a bit underwhelmed with the meal. It wasn’t bad. It was just that the sparse veggie options were definitely the also-rans of the menu. My satisfaction levels weren’t helped by my eating companions having a full Chinese banquet beside me. I tried not to look envious at their plentiful dishes, well cooked and beautifully presented, but I think I got a bit yearning when they got to the crispy duck with pancakes. I loved that when I ate meat. 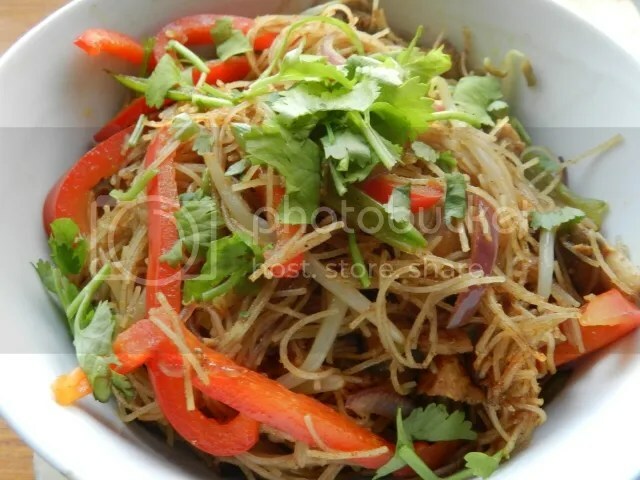 I averted my eyes and went back to my not completely crispy noodles with vegetables. Maybe because I yearned a bit more than usual over a meat dish, it got me thinking. As with most meat dishes, it’s actually the vegetables and the sauces that add most of the flavour. What you would need is a vehicle to carry that flavour and add a bit of mouthfeel with it. Once you ask the right question, the answer is obvious – mushrooms! I’ve used ordinary button mushrooms here, but if you can get shiitakes they would be the ultimate replacement. You also don’t get the crispy skin texture from the mushrooms, so I’ve upped the crunch quotient in the vegetable garnishes, adding a crispy little gem lettuce. Finely sliced mangetout or sugarsnap peas (if you don’t mind the carbon footprint) would work brilliantly too. There’s enough sauce left around the mushrooms after cooking that I nearly left the separate hoisin sauce out. I kept it in, however, and I’m glad – it adds another level of flavour that the dish wouldn’t be the same without. I can definitely recommend this one. And next time I go to a Chinese restaurant I won’t feel quite so forlorn. Heat up a small frying pan or omelette pan. Add the mushrooms, the soy, five spice powder, rice wine, sesame oil and sugar. Stir round until the mushroom are cooked and sauce is thick, bubbling and clinging to the mushrooms. Warm the pancakes through either by steaming them or in the microwave. Plate the mushrooms, spring onions, lettuce and cucumber so that everyone can take bits of each. Have the hoisin sauce in a dish, and the pancakes on a plate. To eat: take a pancake, spread with a little hoisin sauce. Add a little of the mushrooms, onions, lettuce and cucumber. Fold the pancake and eat, trying not to dribble out of the other end. I love Chinese food, but I have to admit that when I cook it for myself I normally stick to either black bean sauce or a packet sauce. I generally associate ‘authentic’ with ‘complicated’, so I was very pleased to come across this tofu recipe in the Guardian. I like spicy food and it seemed simple enough so I decided to give it a go. I could get the chilli-bean paste easily enough in my local Waitrose, but not the fermented black beans. However, I decided that black bean sauce would probably be a reasonable substitute. I have to say it worked pretty well. I didn’t end up with as much sauce as the website photo, because I forgot to add the water, but it didn’t taste dry to me. I also added half a little gem lettuce as I’m always trying to keep up my intake of green leafy stuff. I also didn’t bother with boiling the tofu before using it. It broke up a little bit, but as you’re simmering rather than stir-frying it didn’t make much of a difference to the finished product. It’s hot, salty and easy to make. I’ll be cooking it again. 1) Chilli bean paste is freaking hot! Without being a masochist, I like my chilli. My favourite sauce on rice salads etc is the Encona Hot Chilli Sauce. 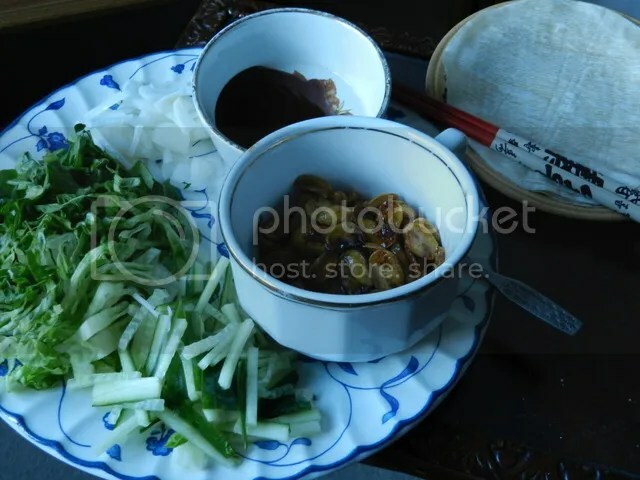 But Sichuan chilli bean paste beats that. Taste before you cook with it, I ended up halving the amount used. 2) Be careful about how hot the oil is before you add the chilli paste at the beginning of the recipe. I went on automatic and let it get as hot as I would for normal stir-frying. Big mistake. When the paste hit the oil it turned into splatter city. I was wearing sandals and my feet were getting splashed with the hot oil. Keep it medium heat as per the recipe. 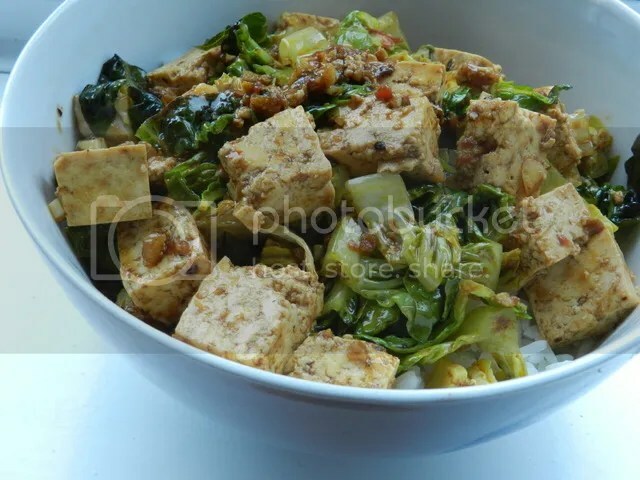 I don’t know about Pock-marked Old Woman’s Tofu – I think I’ll call it Hot Foot Tofu from now on! Any restaurant review of the Ping Pong dim-sum-with-cocktails chain tends to get a bit sniffy about ‘authenticity’ and ‘mediocrity’, but I think it’s a good place to get introduced to dim sum. The quality may not be the highest, but neither are the prices, and it is consistent. They have a good range of set menus, and if you decide to go ‘off-piste’ there aren’t any dangers lurking in the far reaches of the menu. They are also veggie-friendly. You get two sets of chilli dipping sauce and I’ve never had them set down on the table without the waitperson explain that one of them has shrimp in, while the other is vegetarian. Of them all, the hoi sin baked puff was the best. 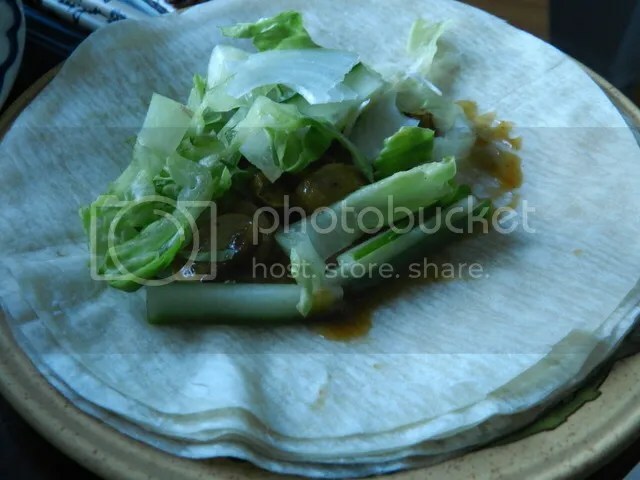 It was a bit dry, and could have had more filling, but you could taste the hoi sin sauce and it was crumbly and yummy. The vegetable spring rolls were the thin standard ones – crispy and hot, but the filling was just an excuse to have something deep-fried and dipped in sweet and sour sauce. The three steamed dumplings I had were nice, although the spicy vegetables weren’t very spicy and there wasn’t a lot of filling in the sticky-rice. And this is going to be where I complain a little. I enjoyed the meal when I was eating it. I wanted to eat dim sum and it ticked all the boxes for me while I was eating. It was when I was coming home and thinking about how to write this blog post that I realised there was nothing to distinguish the three steamed items from each other. They were finely chopped, pretty bland vegetables in a soft and sticky casing. I may as well have picked the cheapest and had three portions of it. That’s OK, in a way, I suppose. I may have picked the wrong things (although most of them show up on the vegetarian set menu). But I have eaten at Ping Pong as a meat eater and it doesn’t happen with their non-vegetarian dumplings. The chicken and cashew nut dumpling tastes different to the har gau, which tastes different to the chicken shu mai. If they can do that with the standard meat and seafood, why can’t they do it with the standard vegetarian ones? Despite all that, I did enjoy the food, and I will go back (although that has more to do with location than anything else). And the iced lychee and ginger tea was delicious! Food for three, including wine for two, came to £107.